I had this all down pat back in the 70's after the first embargo. Anyway I used to have these very small fans you mount at the top of the doorway openings that moved air from one. Probably got thrown out during one of our moves. Has anyone seen any of these mini doorway fans around these days? I am probably wanting somehting around 50 cfm so as to not create drafts and it should be fairly quite. What brands to you guys use - if any? My second floor is great but the floor with the stove is hot on one side and cool on the other and I really don't want to move my designer enamel stove to the basement or add another stove. Any other ideas? 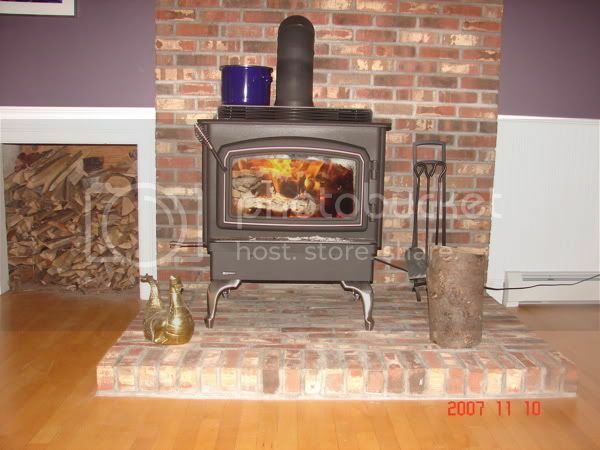 Re: Wood Stove heat distribution. Do you have a central heat system, I have a gas fireplace and I turn the heat system off and run the fan, it distributes the heat throughout the house pretty well. Have no central air - baseboard hot water. Nice stove I have a Lopi Leyden OK but hard to burn clean at low fire rates - - What is that its a beauty the way you have it set up -Looks like some kinds air movement system on top? I am probably going to add a built in wood box - your setup is great - I wanted the raised brick but setteled for a pre build slate system due to weight issues..... Anyway, the stove (takes 24 in logs) is too big for a 13x15 room. My new stove is a Regency F3100L, Rated for 80,000 BTU with the Airmate fan (Blows air up the back and over the top of the stove....) I had to replace the entire Hearth, Raise the thimble and the works, was a pain but it's done and the season is upon us...! I bought duct fans at HD . Look like a bilge blower, run on 120ac. These are great for moving air between rooms, If you can get access to run the ductwork. I used four inch dryer hose. The trim rings give a nice finished look. In a day or two I'll show you guys the "Mother of all Heaters", I use it to heat my shop and we load whole logs 12' into it at a time, about 6 12' logs will last about 3 days. Yes, it has blowers, serious blowers, and works very very well. BTW. LI that's one of the nicest stoves I've ever seen. Pretty penny. I don't really know what a smolder stack is, but I have an Inert Landfill, so logs are plentiful, we're just converted one of the roll-off dumpsters into a heater, with a BIG blower bow life a pit-burner blower to one end and piped the shop. I heat my home with wood, Home Depot has the small fans they move air but make a lot of noise. The sound is like torture I just cant take it. The folks at the stove shop recommend a small fan that is like the ones used in computers, it is supposed to be silent? I have one ordered we will see? I'll show ya some pics today. Lets just call it a garage ma hall. You can always cut your own vents in the ceiling above the stove and install separate ductwork to move the heat into the desired rooms using one or more of the duct fans mentioned above. My house is a one story ranch, so that's the only way i can effectively move the heat around the house. Its easy and cheap. It will pay for itself in a few weeks. Works incredibly well. They are banned here also. Probably emissions or fire laws, I am guessing. Thanks. Yes it is pretty - more or less bought it as a piece of furniture and to use as a fireplace (doors open) from time to time; but now with $3. plus oil and since I have pretty much unlimited free wood out back am using it for heat. My neighbor did the masonary work with local stones for my 96 Johnson 130 Outboard. Its fine - lots of BTUs but I really need to add a flue liner in my chimney to get the right draft to get a clean low-fire burn. Supposed to have 85 sq. in max. chimney cross section area (9 by 9) I have about 160. Thanks to everyone for the advice. I did buy one on the web at ebay that is supposedly quiet - sounds like the one many of you have described. My buddy in town as of now has about 55,000 into his geothermal (heat and air) unit in his new home. I can only imagine what a retrofit system would be. I just paid $271 for 90 gallons of heating oil. I have been using about 900 gals. per year. Even at $4. per gallon it would take me almost 15 years to recover that investment. And that doesnt include the electricity. I built a garage this summer and this past weekend put in a Gatling stove which my neighbor sold me for $65.00. I ran into a problem with the roof flashing as my roof is 12/12 and the flasing in the kit was for like 6/12 and now I'm having trouble finding the proper roof flashing. Anyone have any idea were I can purchase this flashing for an 8 1/4 pipe for a 12/12 pitch roof.